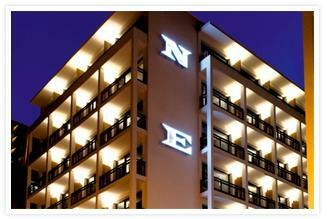 Hotel New, Athens. New Hotel Athens. The ambiences of the hotel are sophisticated and accurate down to the smallest detail, provided with sleek jagged mirrors and bespoke modern furniture, which were created from the use of recycled materials and wisely made by local art students. As concerns the appointment with the gastronomy, our structure places at your disposal an optimal restaurant, in order to satisfy even the most demanding palate. In fact, the restaurant proposes a big variety of optimal local products, always fresh and selected. The breakfast is served from 07.00 to 10.30, the lunch from 12.00 to 16,30 and the dinner from 18.00 to 00.00. Moreover, we offer a further service that includes: coffee, bakery & breads, sandwiches, salads, pastries, lemonades and many other products smartly packaged.